Sometimes our clients are looking for alluring stage drapes that will completely captivate audiences of all kinds, yet still be adaptable enough to travel from location to location while out on a tour. Recently I had the opportunity to work with the talented production manager Deb Miller, with renowned tour production company OSA International. 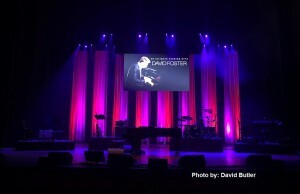 They wanted us to build them custom theatrical stage drapes for the upcoming tour for visionary musician, songwriter, composer, producer, and recording artist David Foster. 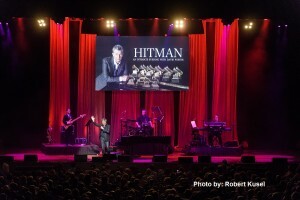 Designing the stage for his “The Hitman Tour” this past summer, Deb wanted to make sure that the drapes would be stunning in and of themselves, but also be versatile enough to work in concert halls of all sizes and configurations. 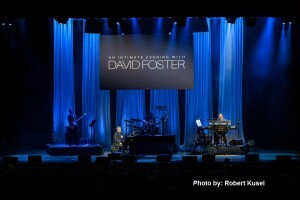 Fabric choice was going to be absolutely vital in constructing this distinctive stage design. Deb knew that they wanted to be able to hang tall, silky, shimmery strips of fabric in panels as their main backdrop. This would enable the tour and lighting designers to not only fill the stage to be as wide or as narrow as it needed to be, but it would also allow them to utilize the “negative space” in between each drape to give the design extra depth and dimension. Deb decided on a glittery White-Silver Domino fabric for these 30’h panels. We began with a reversible material that has striking metallic threading and a very soft hand, we then shirred this dazzling yet lightweight fabric at 100% fullness–enabling the tour to easily style these “ready to hang” curtains from show to show. And ties on top of the curtains allowed them to be hung as narrow or wide as the designers desired. 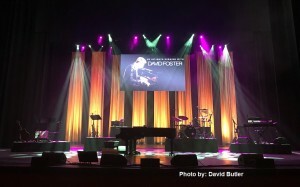 Imaginative, colorful theatrical lighting effects played off of these textured drapes beautifully, helping give each segment of Mr. Foster’s shows a truly one-of-a-kind look and feel—just like his exceptional music! Brilliantly photographed by both Robert Kusel and David Butler, you can see how these drapes added an impeccable touch to the tour’s overall timeless motif. We love to facilitate our clients’ unique design visions becoming a breathtaking reality through our fabulous custom-built stage drapes. Contact one of our sales reps today and let us further assist you with some lovely custom—or rental—curtains that will delight and excite your audiences, too! Was completely blown away with the exquisite stage design this client built using these custom drapes—the lighting and configuration was absolutely gorgeous! Loved being able to help them create this beautiful look.